If you have been planning to migrate your blog from Blogger to Wordpress but found the whole process of importing blogger posts with comments into Wordpress too technical and complicated, here's a very good news for you. You can now move all blogs posts and comments from your Blogger account into your WordPress blog with the click of a button - it's so simple that even mom can do it as long as her blog is hosted on the new Blogger platform. 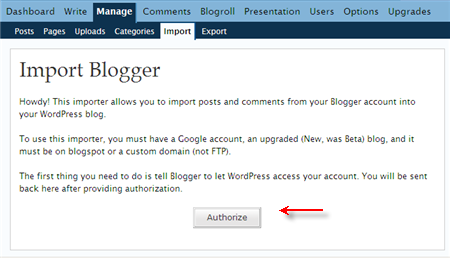 All you have to do is authorize Wordpress to use your Google account and Wordpress will display a list of blogs associated with Blogger account. Select the blog that you like to import in blogger and click import. Voila! All your posts, comments, categories (Blogger labels) and users will be visible in Wordpress in few minutes depending on the size of your Blogger Blog. Even if you have no plans to switch from Blogger to Wordpress, this is still an excellent option to create a backup of all the posts and comments from the Blogger blog. For Geeks: This Wordpress-Blogger Importer will not change anything in your Blogger hosted blog - neither the timestamp formats nor the blogger templates. It simple uses the Google Blogger API to fetch the blogger posts into Wordpress. The Blogger Importer script will however not import the Blogger images to your Wordpress installation. And there's no way to specify filters on your Blogger posts - everything will be imported in one go.